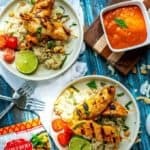 This Curry Chicken Satay is easily one of the best dinners I’ve made this year. I only wish I’d doubled the recipe! It is ridiculously easy to make and even more wildly delicious than it looks. It is hard to believe a 20-minute meal can be packed with so much flavor! 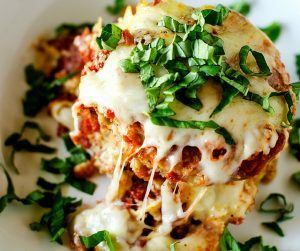 You won’t believe how much flavor is in such an easy to make dish! This post is brought to you by Saffron Road. All opinions are my own. Growing up in a traditional southern home, much of our life centered around the dinner table. While my mother never shared my passion for cooking, she has always been a great cook. Her specialty was simple fare that tasted great. She had her repertoire of recipes and wasn’t one to try new things often. Since I grew up in a smaller town with limited restaurants, I was an adult before I was exposed to ethnic foods. I still remember the first time I tasted Thai food. At the time, I lived in Atlanta which offered so many new experiences. I was in my mid-20’s and worked at a place where everyone went out to lunch together almost every day. Economical, no. But it was an amazing time of culinary adventure that still shapes the way I cook today. Truth be told, when one of my co-workers suggested Thai food, I was nervous. I didn’t know what it was, and I was terrified that I was destined to spend the rest of the day hangry. Still, I was always up for something new, and I kept my concerns to myself. Luckily, it was love at first bite. The flavors! Wow, they just blew me away. They were so different than anything I’d ever had. We went to that little Thai restaurant many times over the course of the two years I worked nearby, and I loved trying new things. 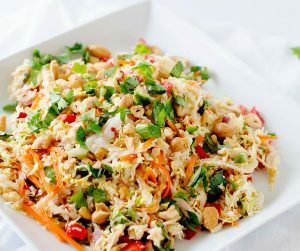 Although at the time, cooking dinner was my greatest passion, I never once attempted to make Thai food at home. Over time I started experimenting with ethnic foods, but I’ve been searching for ways to make it more approachable. Something that would allow me to enjoy flavors from around the world, even on a Tuesday night when I needed to have dinner on the table in less than 30 minutes. And that is where Saffron Road comes in. Some of their products include broths, naan, entrees, crazy-good crunchy chickpeas, and lentil chips. Saffron Road Simmer Sauces have become my go-to way to have a delicious meal in under twenty minutes. 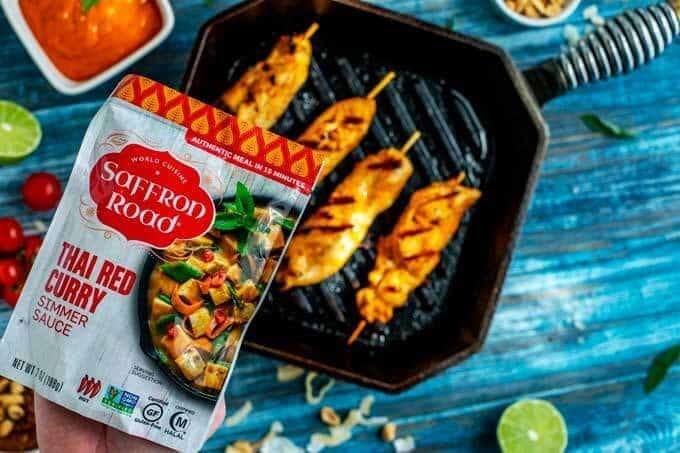 If you love exotic flavors from around the world, Simmer Sauces from Saffron Road are going to become your BFF too! The sauces come in single-use pouches, which means you never have a half-used jar that you forget about lurking in the back of the fridge. All of them are Non-GMO Project Verified, gluten-free, and offer authentic flavor! 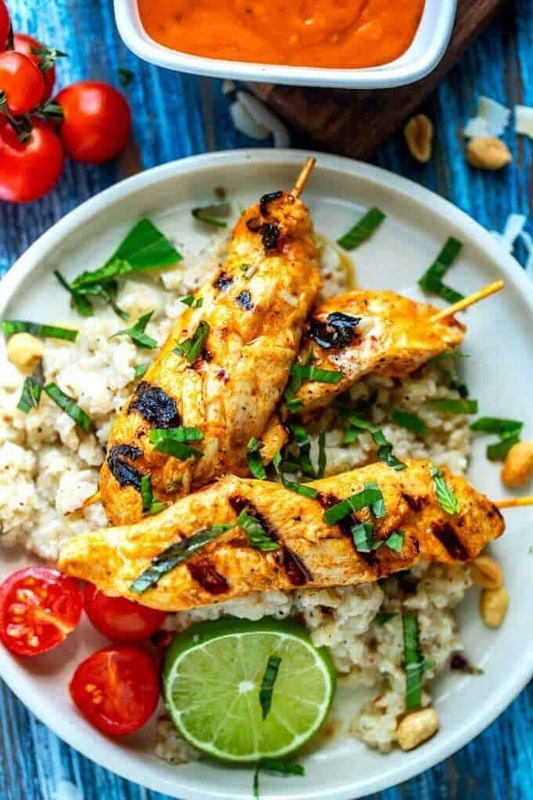 I used Thai Red Curry Simmer Sauce in this Curry Chicken Satay. The whole family couldn’t get over how good it was! I served it with Coconut Cauliflower Rice, and my husband said the flavors reminded him of a high-end restaurant that offers global cuisine that we go to on occasion. 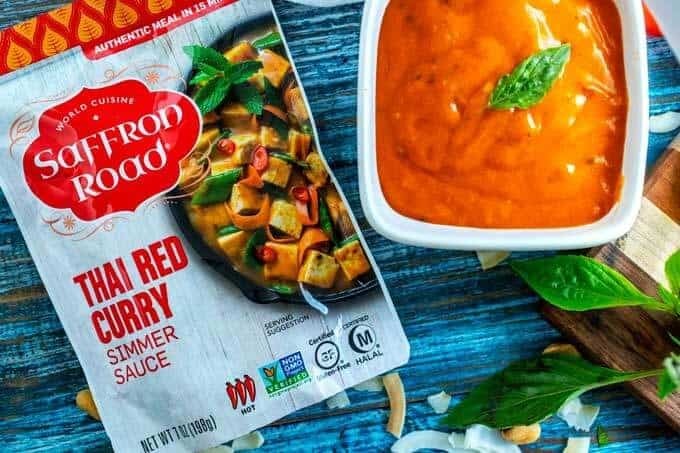 Other flavors from Saffron Road that you are going to want to check out include Coconut Curry Korma Sauce, Korean Stir Fry Simmer Sauce, Lemongrass Basil Simmer Sauce, Pad Thai Simmer Sauce, Thai Mango Simmer Sauce, and Tikka Masala Simmer Sauce. Find a Store Near You or Order on Amazon! 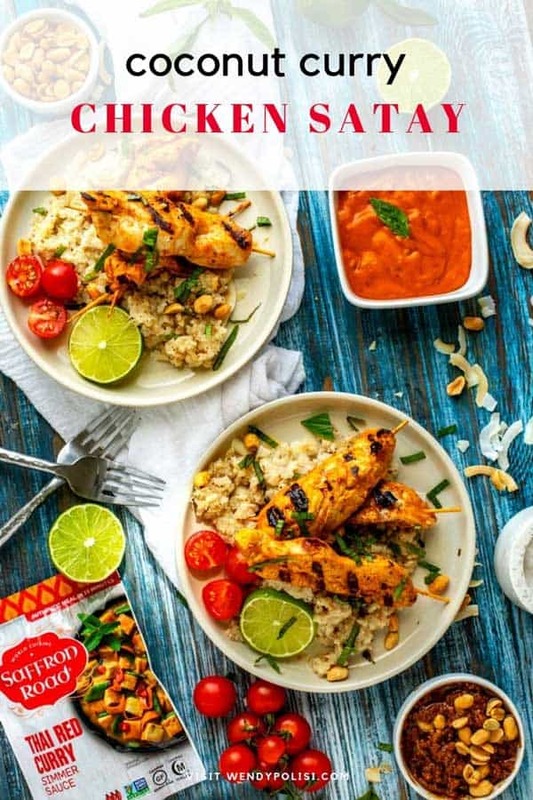 This Simple Coconut Curry Chicken Satay comes together in less than 20 minutes! If you are using bamboo skewers, soap them in water for 30 minutes. 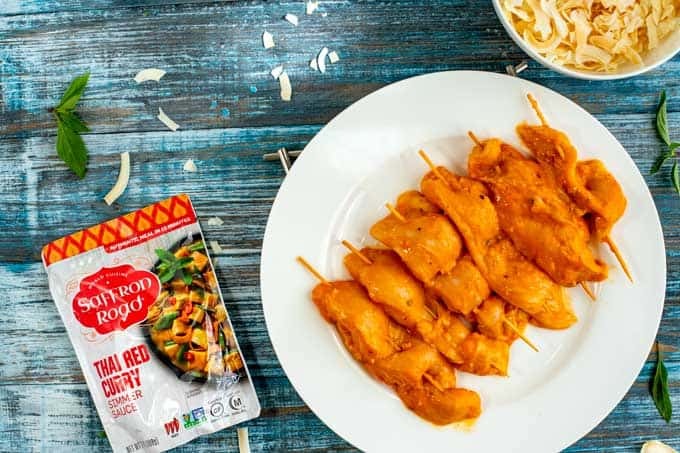 While the skewers are soaking, marinate the chicken in a plastic zip top bag for at least 30 minutes with Saffron Road Thai Red Curry Simmer Sauce. Make the peanut sauce while the skewers soak and the chicken marinades. 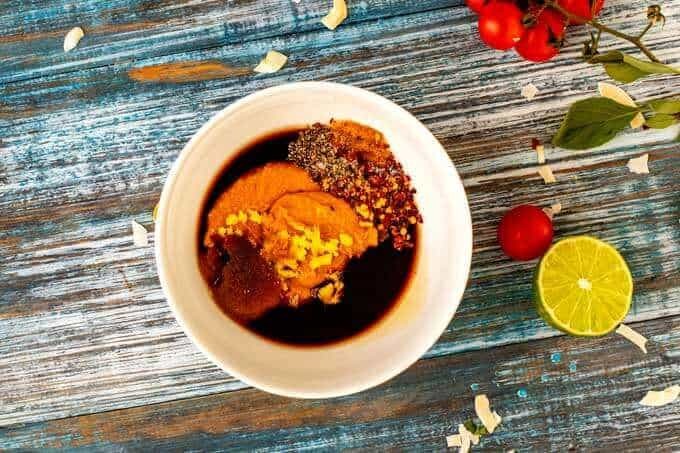 To do so, whisk together peanut butter, coconut aminos, brown sugar, lime juice, and ginger in a small bowl — season to taste with salt, pepper, and crushed red pepper flakes. Remove chicken from the bag. Discard the remaining marinade. Heat a grill or grill pan to medium heat. Divide the chicken between 8 skewers. Grill the chicken for 5 to 6 minutes. Flip. Grill for an additional 5 minutes, or until cooked through. 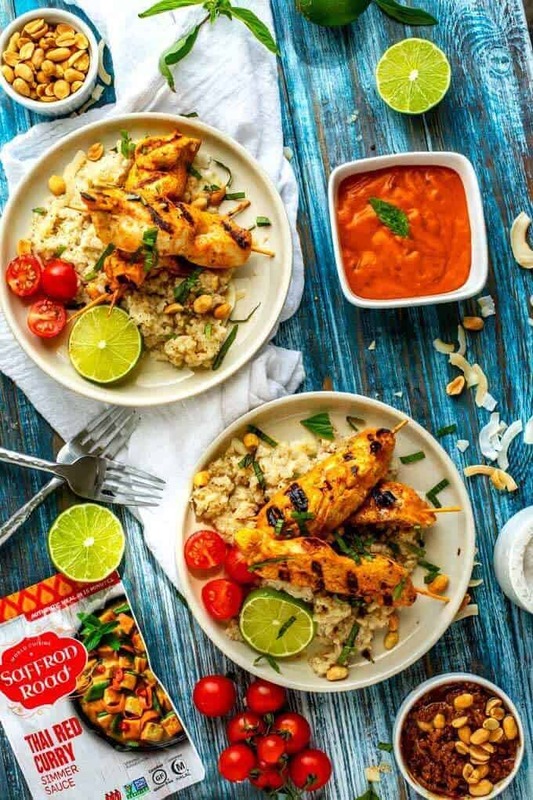 Serve the chicken with the Peanut Sauce and additional Saffron Road Thai Red Curry Simmer Sauce on the side. While the skewers are soaking, marinate the chicken. Place the chicken in a zip top plastic bag. Pour the Saffron Road Thai Red Curry Simmer Sauce over the chicken. Marinade for at least 30 minutes and up to overnight. While the chicken is marinading, whisk together peanut butter, coconut aminos, brown sugar, lime juice, and ginger. Season to taste with salt, pepper, and crushed red pepper. Remove chicken from the bag, discarding the remaining marinade. Divide the chicken between 8 skewers. Heat a grill or grill pan to medium heat. Grill the chicken for 5 to 6 minutes. Flip, grill for an additional 5 minutes, or until cooked through. 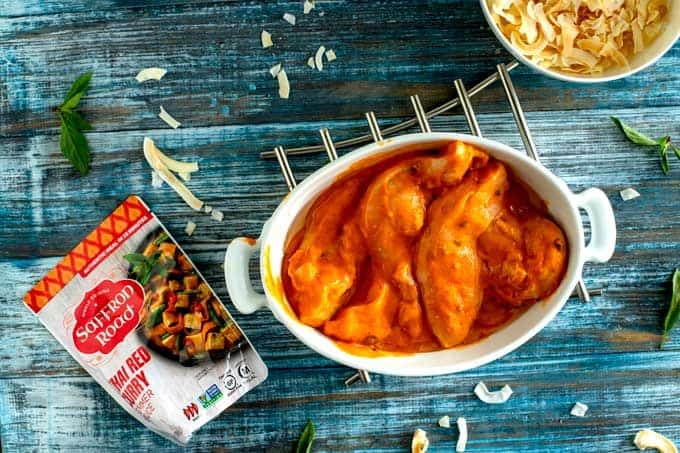 Serve chicken with additional Saffron Road Thai Red Curry Simmer Sauce and Peanut Sauce. Holy wow! This looks so good. I definitely have to make this for the weekend. Om nom nom. 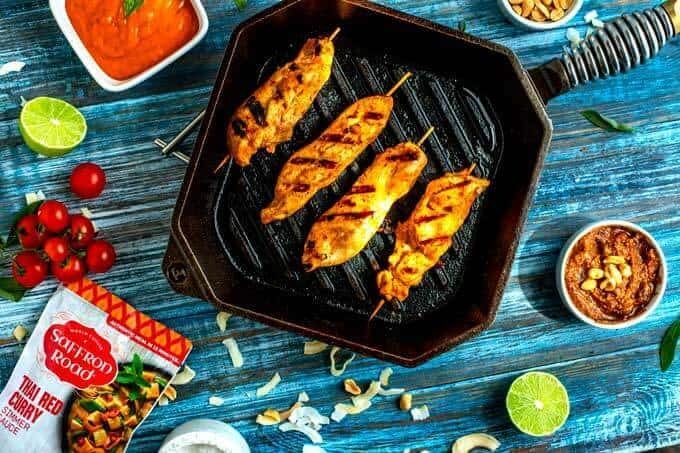 There is nothing like a good curry and this one sounds absolutely delicious – I have to admit to liking a good chicken satay! Although i really like a nice yellow curry. my palate doesn’t tolerate much heat. I like to quip that I still have my taste buds intact. Is there a milder, yellow curry available ? It’s so fun to discover new foods! I’m glad you’ve been diving in. This recipe looks awesome. Thank you for sharing it with us! I want to make something like this on the grill. I love the sound of your peanut sauce. I’m going to have to give that a try. They are great, aren’t they? These are some of the best I’ve ever used. I am making chicken tomorrow. I wanted to try a new rceipe. Will try your Curry Chicken Satay. This looks so delicious! I’ll have to add this recipe to my to-do list! I would swap the chicken for shrimp. I am pescatarian but it can be a curry shrimp version of this still sounds good!